2019 Ford Mustang Bullitt quick spin review | Car News, Reviews, & Pricing for New & Used Cars. The 2019 Ford Mustang Bullitt is the latest iteration of Ford’s venerable pony car to hit showrooms (the new GT500 won’t go on sale for another few months). The Bullitt is based on the Mustang GT Performance Pack 1, meaning it’s fitted with six-piston Brembo brakes up front, a Torsen limited-slip differential in the rear, heavy duty front springs, a bigger rear sway bar, and retuned traction and stability control systems. Additionally, the Bullitt gets a slight bump in power over the standard GT, up 20 horses thanks to a slight ECU tune, a cold-air intake and the 87mm throttle body from the Shelby GT350. That makes it the most powerful non-Shelby Mustang currently on sale. Visually, the Bullitt ditches most of the Ford and Mustang badges in favor of a few Bullitt badges on the trunklid and interior. It’s only available in two colors — Highland Green and Shadow Black — and is fitted with a set of black 19-inch Torq-Thrust style wheels. The exhaust tips have been painted black, too, and the badgeless grille gets a fine chrome lipstick around the rim. Its $47,690 MSRP sounds like a lot, but the Bullitt comes with nearly every option currently available on lesser Mustangs. That includes heated and ventilated leather seating, dual-zone climate control and a 12-inch digital instrument cluster. Road Test Editor Reese Counts: I love muscle cars, and, outside of the Shelby GT350, this is the best Mustang currently on sale. It’s one of the few special or limited-edition cars from any automaker that I feel is actually worth springing for. The upgrades, both mechanical and visual, add up to something that’s far more than the sum of its parts. It’s sharper to drive than a standard GT and sounds damn good, too, especially blasting around greater Los Angeles. I dig most of the visual changes — especially the Highland Green paint and white shift knob — though the retro wheels look a bit out of place with the current design. Still, that’s a minor gripe. I felt like a king roaring out of the hotel parking garage. The exhaust was bouncing off all the buildings and I got a bit of wheelspin on a hard 1-2 upshift. My wife — usually not one for my sports car antics — seemed to enjoy herself, too. At the end of the day, the Bullitt is one of those cars that inspires childish giggles every single time you get behind the wheel. What more could you ask for? 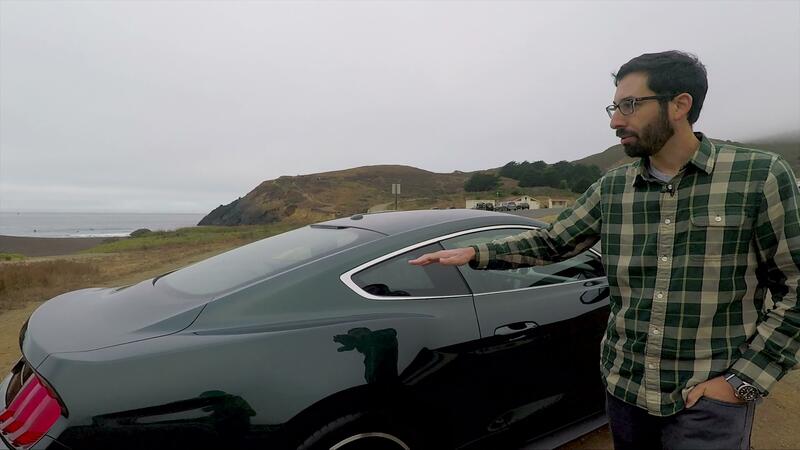 Associate Editor Joel Stocksdale: I was skeptical of the Bullitt Mustang when I went to pick it up. I had read the glowing reviews from colleagues but just couldn’t imagine that a bit more power and a combination of options could really be so transformative. After an evening behind the wheel, though, I came out in agreement. While I’m not always a fan of movie-inspired or replica cars, there’s no question that Highland Green is a gorgeous color on this car, and I love the debadged exterior. I would even go a step further and remove the Bullitt logo on the back and on the dashboard. The interior is lovely, too, with the machine-turned metallic trim and the optional grippy but comfortable Recaro seats with exterior-matching green stitching. As good as it looks, it drives even better. And drive it I did, taking it up to Angeles Crest Highway for a mountain cruise. While I know the Bullitt has just a bunch of existing Mustang options, it felt more fun than the long-term Mustang GTs we had last year. The big difference: It’s much more eager to turn in to corners, alleviating the nose-heavy feeling of those other Mustangs and giving it a real sports car feel. I didn’t particularly notice the extra horsepower, but didn’t care either, too busy reveling in the never-ending rumble from the adjustable exhaust. Seriously, it sounds so good, and the ability to go from silent to setting off car alarms at the press of a button makes this the only exhaust you’ll ever need on a Mustang. A couple small complaints, though. First, the clutch annoys. It has a lot of travel, and when letting off the pedal, the clutch doesn’t start to catch until you’ve lifted your foot quite a ways from the floor. Second, I can never sit low enough in the Mustang. I’m sure many people coming from crossovers will like being able to sit up reasonably high, but it detracts from the sporty feel. In the end, these are things I could absolutely deal with considering how good the rest of the car is.